OTTAWA - Early childhood caries (ECC) is a serious health problem in North American Indigenous communities that needs immediate attention, say the Canadian Paediatric Society (CPS) and the American Academy of Pediatrics (AAP) in a joint statement released today. In some Canadian Aboriginal communities, more than 90 percent of young children have cavities in their primary teeth. Early childhood caries can be painful, affect a child's ability to chew food, disrupt sleep patterns and cause problems with growth. "The influence of early childhood caries on overall childhood health and well-being goes well beyond the mouth," said Dr. James Irvine, a Canadian physician and co-author of the position statement. "Indigenous children have not fully benefitted from the many advances to improve oral health in North American children. This position statement emphasizes the reduction in health disparities on both sides of the border." ECC, also known as early childhood tooth decay, is the most common paediatric infectious disease. The condition is worsened by dietary habits and oral hygiene. The effects of ECC go beyond the tooth and have a significant influence on overall child health and well-being. According to the statement, prevention is the most-cost effective, long-term solution. Although water fluoridation is effective and inexpensive, few Canadian Aboriginal communities have access to fluoridated drinking water. To be effective, solutions must involve collaboration between Aboriginal communities, primary health care providers, policy makers, and public health practitioners working in those communities. 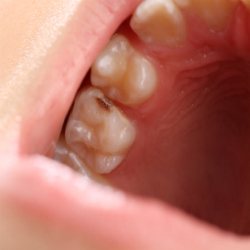 "Many physicians continue to view early childhood caries as a dental problem to be treated by dentists," noted Dr. Steve Holve, co-author of the statement and member of the American Academy of Pediatrics. "We want to emphasize that early childhood caries is an infectious disease, knowing that infectious diseases are problems in which pediatricians and primary care providers are experts. The skills of our dental colleagues are highly valued, but we hope to shift the focus of treatment for early childhood caries to primary care providers and preventive measures such as topical fluoride varnishes." Pregnant Aboriginal women should have access to prenatal screening that includes dental health promotion, with referral for dental care if needed. Aboriginal children should have access to dental health professionals before their first birthday. Physicians should use well-child visits to educate parents and caregivers on proper oral hygiene and diet, including supervised use of fluoridated toothpaste after the first tooth has erupted. Aboriginal children should have access to oral health prevention and treatment services, including fluoride varnish. The Canadian Paediatric Society is a national advocacy association that promotes the health needs of children and youth. Founded in 1922, the CPS represents nearly 3,000 paediatricians, paediatric subspecialists and other child health professionals across Canada.